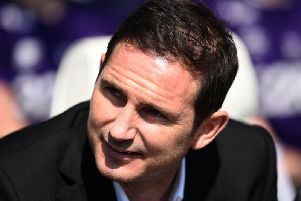 A very good 3-0 at Birmingham last Saturday has Derby County two points clear of Cardiff and five points clear of Friday nights visitors to Pride Park, Bristol City. The Robins will provide a tough test for the Rams, but it’s a golden opportunity for us to extend our lead over them to eight points. Their manager Lee Johnson has worked wonders this season and the loyalty the clubs owners have shown in him is certainly paying off. Most of the discussion this week has been about Gary Rowett entering the transfer market to bring in Cameron Jerome from Norwich for a fee believed to be about £1.5m. Reaction has been mixed, but some fans are now so fully signed up to the Gary Rowett way that they’d trust him to sign the Chuckle Brothers and get something out of them. David Nugent with Matej Vydra appears to be the first choice when it comes our attacking force, but Sam Winnall has chipped in with a few goals too! Chris Martin has had to make do with a few cameo’s and at the time of writing this, appears to be on his way out either on loan or with a full transfer. You have to feel for Martin a bit! He had three superb seasons for us before Nigel Pearson shunted him off to Fulham last season and has now found himself well down the pecking order to start games. Cameron Jerome is an interesting signing! The 31 year old does have scoring feet at this level and was a target during the last transfer window. He will being something new to the table! He is good in the air and has a bit of speed about him. He will certainly be a menace when he comes off the bench in games that he doesn’t start! A good weapon against tired legs. What will be interesting is seeing where Chris Martin and other players like Ikechi Anya, Darren Bent and Jason Shackell end up at! They are obviously not in Rowett’s plans and should still do a decent job for most Championship sides. I would prefer us not to let Martin go to any promotion rivals! We don’t want him coming back to haunt us! So it Friday night under lights! Let’s get it on and push on!